Kayak Rental Key Largo: What’s The Best Way To Explore Key Largo? Honestly, asking us to choose between kayaking and jet skis is a hard one. They’re both great options in their own rights! But trying to compare the two is like comparing apples and oranges — they’re both good for you, but they offer different nutrients. In this case, jet ski and kayak trips are both a ton of fun, but in different ways. There’s a reason we offer a “Do It All” package that lets you enjoy jet ski and kayak rentals on the same day (plus parasailing, too). When you want to feel the wind rushing past and the exhilaration of speeding over open water, jet skis are the way to go. A jet ski rental gives you the freedom to ride the waves and take in all that the Florida Keys have to offer — that’s Gulf-side, the Atlantic Ocean, and plenty of inland waterways, if you feel so inclined. You don’t have to stick around Key Largo, either. With the speed of a jet ski, you can follow Highway 1 down to Key West, skimming past the other keys on your way. Kayak rentals and tours offer the same freedom as jet skis, but at your own pace. 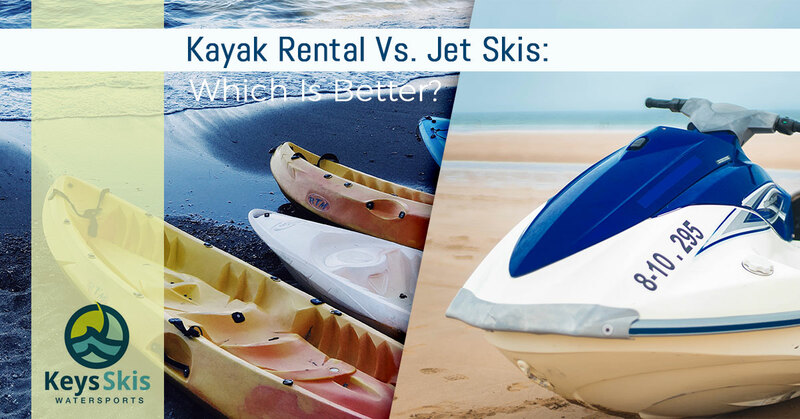 In point of fact, kayak rentals actually offer you even more freedom than jet skis do. They’re slimmer and shallower, plus they aren’t motorized, so kayaks can venture into a lot of waterways that jet skis can’t. If you want to weave your way into the mangroves, kayaks are going to let you go further and navigate more easily in occasionally narrow passageways. Kayak rental also means you can get closer to North America’s only living coral reef system! If you want to spend the day snorkeling around the reefs, a kayak will help you get closer and do so in a way that’s better for the reefs. When it comes down to it, we still feel like neither jet skis nor kayaks are better than the other because they offer such different experiences. Instead of choosing, try out both options! Head out for a jet ski tour one day, and spend the next exploring the Keys by kayak — or connect with Keys Skis and Adventure to do it all! Reserve your adventure online today!